Macro was failing for years outside [1970-3000]. Now it will work for any year. CardDolphin: Email support@getonetastic.com so we can diagnose. Yes, even on an empty page. CardDolphin: Does this happen on a particular page, which is probably too big? Can you try this on an empty page? This macro keeps hanging at the "Updating page contents" stage. I have to cancel and then end OneNote task in Windows to exit out. How can I avoid this? You would want to specify the previous version of this macro which is version 52EB2C. Can someone tell me where I can find the version work with OneNote 2010 ? Since I made the upgrade, that macro don't work anymore on my pc. Insert Monthly Calendar (updated on February 24, 2019) can't work in onenote2013. Due to a firewall in my company system, I am not allowed to access any macros. Could be possible to send me or upload to your website the macro code "Insert Monthly Calendar" so I can create manually my own macro? I just discovered OneTastic, and love the calendar macro. I'm pretty picky about how I want to use this, so I'll try to describe it and maybe someone can tell me how feasible it is. I use OneNote on my laptop to sit on the left side of my screen so that I can always see what I need to do today and the next few days. I don't have to click on it to see the next few days, I just manually enter dates and then tasks for each day. I'd like to have a calendar generated but in a single column with the day of the week, and the date in each cell, and of course room to enter text. A "normal" calendar layout doesn't work for me, since I have to constantly go back and forth from my browser to OneNote see more than one day. I know I could just make a table, but I'm trying to prevent as much manual entry each month as possible. I have some programming skills, so I could probably make a copy of the macro and see if I can do what I need, but I'm kind of hoping someone has already done it. there used to be a menue to insert tables for each single day - for some reason, I cannot find this anymore.. can you help me with that issue? Omer: thanks for your help. After installing FiddlerCap and running it I could install the macro. When I retried with FC it did not work. I sent you the .saz file. PeterB: You can try to capture a Fiddler trace and send it to support@getonetastic.com. See: https://www.telerik.com/fiddler/fiddlercap. Make sure to check "Decrypt HTTPS traffic" and at step 7 where it says "go to whatever site you need and reproduce the problem", open the Download Macros window to reproduce the problem. Omer, I have no problems with my internet connection, nor with my firewall. In fact, I was able to download the macro to my computer's download folder but cannot install it because of the error message. Should I uninstall & reinstall Onetastic? There was an error while getting macros from Macroland. Dan: Settings > Compact Mode does something similar. See if you like that. I really love this ribbon idea shown below - you have made it for the download macros button on the Ribbon. Add my macros to it. I would love to have this as my macro collection grows - I can organise it like you have. I added new tabs on the ribbon - but I still prefer this drop down it is so nice to look at and use. Anonymous: Thanks for reporting. I fixed the macro. Is there a version of this for OneNote on Mac? Omer, is it possible to amend this macro so the user can choose where to insert the calendar on the page, instead of the macro always putting at the end of the page? Why can the calendar be inserted at the end of the page only, and not where I want to insert it on the page? Why is the current day not highlighted, maybe as an option? Heather Murchison: No it just means that that specific page has some problem. If you can send a copy of the page to support@getonetastic.com I can look into it. It works if I use a blank page, which is frankly what I normally do when using my desktop. Randomly I tried to add a calendar to a page that already had content... so that doesn't work by design? Heather Murchison: Does it matter which page you are inserting to? Can you try to insert into a new blank page? I just installed OneTastic and this macro on my Surface and I am getting an error when I try to insert a calendar into a OneNote page. It says Error at the top and then The XML is invalid. Any ideas why? This macro works great on my desktop (Win10, same as my Surface). rlivermore: I think you are confusing OneCalendar, which is a calendar view of your existing notes and this macro. You want to download this macro, double click install it into OneNote and run it under Macros>Calendar dropdown in your home tab. ">>When I click on the calendar link under Macros": I think that is if you follow Macros>Download Macros>Calendar>this macro. Hello, I'm not understanding how this new calendar option works. When I click on it, it opens a calendar, but I don't see a way to insert it into a page on OneNote. When I click on the calendar link under Macros, I end up on this page. How do I actually insert the calendar into a page in OneNote? Thank you in advance for your help. Scott111: Currently there is no way to get the macros code other than using the macro install. If your machine is behind a firewall, you could potentially download it on another machine that is not behind a firewall (like your home computer) and then get the code to the other machine. Also make sure that you have latest version of Onetastic, because users reported that older versions of Onetastic may fail to download macros with Access Denied. Is there a place that I can download the macro's code? I tried using the download link, but Ontastic cannot get the code. I get the Access Denied error, which the FAQ says is probably due to a firewall block. If I could download the code, then could I just paste it in as a new macro? mwoffenden: Yes you need to install the updated macro as well. Sorry for not making that clear. After installing Onetastic 3.0.0 you were still using your old macro. Follow up to my previous comment. 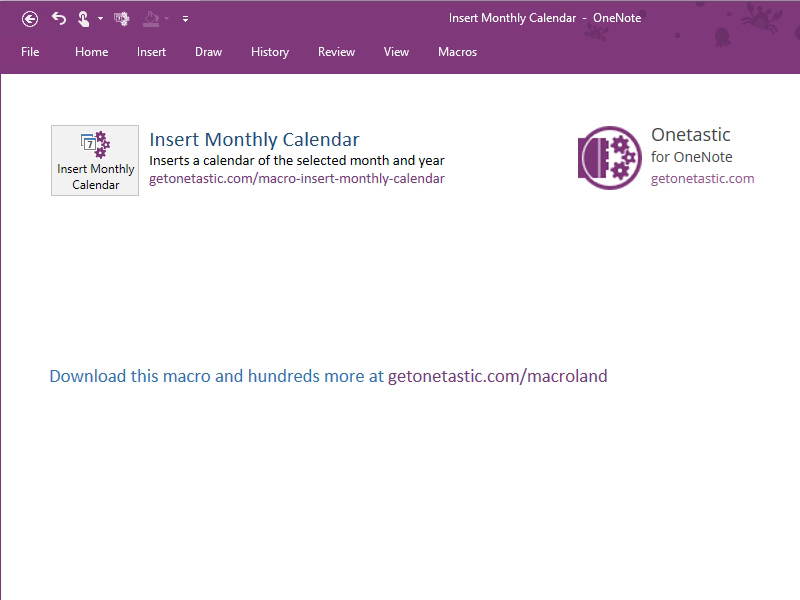 For some reason the fixed "Insert Calendar" macro was not installed when I upgraded to Onetastic 3.0.0. So I installed the macro again from this page, and now it works -- with a single dialog at that. Great! I just installed the 64 bit version of Onetastic 3.0.0 (on 64 bit OneNote). The year now defaults to 2016, however the month still defaults to January. Also there are two popup dialogs, one for Year and a second one for Month. Good, but would be better if the dialog would default the Year and Month to match today's date. hello, i just came here to say how much i'm tankful for all this i have no words, worlds better with people like u. thank you!! Did you save the macro installer to your machine? If so, did you check to see if the operating system had the security of the downloaded macro marked as blocked? Then try to install the macro again. Hope this helps. Like Weez, I also get the 'access denied' error message when trying to install a downloaded macro. However, this is only a problem on my work pc, not my personal one, so I'm guessing its a group policy restriction or something. Any way round this? There is an error in some months that start its 1st in sunday and you change the preference to start weeks in monday, example Feb 2015 starts on sunday but the macro just cut the sunday and starts at 2 in monday. By the way, very useful macro and thank you! first - Onetastic is fantastic ! Absolut amazing tool. But I have issues adding macros to OneNote. Could you please advise if it would be possible to dynamically set the Initial Values to the current year/month? bob, if you simply want to invoke stuff manually from each day, you can add links in the cells that run some commands. If you want them to automatically execute on each day, then not really, there isn\'t any scheduling smarts in macros. A related question: would there be a way to use a calendar as a \"scheduler\"? I have made a backup scheme in Onenote( disks ,partitions,files to backup; and backup locations), i know i can use windows scheduler, ( no outlook installed). But i prefer to us ON if possible to remind me when to perform a backup. Rick/Hugh: The macro is updated to have a First Day of Week and Format options. You can edit the macro and modify it to your needs as well. How can I make the Calendar Larger. I am looking for about 2 x width and 3 x height. Hugh: I can update the macro to do that. In the mean time you can use the Macro editor and see if you can modify it as well. Feel free to upload it to Macroland if you get it to work. Any chance you could insert a calendar with Monday being the starting day? Could you please try another browser? The macro file is associated with MacroInstaller.exe and Opera may be ignoring that. The file extension should be .onetastic. If it isn\'t you may try to change the file name and retry. thanks for the fast reply, but i installed Onetastic already before. When i download the macro and double click on it, Opera will open and i see a number. Dro, you need to download the file and double click on it. If you haven\'t installed Onetastic, you need to first download and install it, otherwise you won\'t be able to install the macro. Fausto, thanks for reporting this. Apparently I typed \"Septemberr\" somewhere in the macro, causing the comparison to fail. I just updated the macro, so it should work now. entering the month of September 2013, the result is wrong ... starting with the fact that September is not 31-day ... and that the first falls on a Sunday and Wednesday.